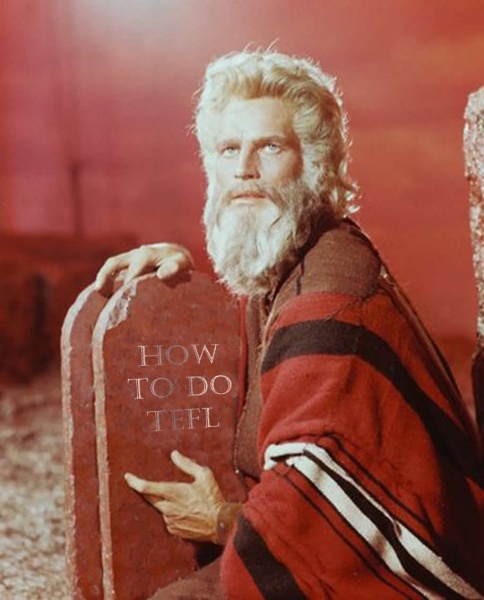 TEFL Commandments are simply basic teaching rules which TEFL teachers follow in the classroom. Some call them maxims, others call them aphorisms, others still call them sayings. But whatever you call them, they are useful to read over and think about every so often and can help both new and experienced teachers! 1. Repeat, repeat and then repeat again. In giving new material to students, the basic language cannot be repeated enough times. I’ll say it again: keep repeating the language item you’re introducing. And then repeat it once more for good measure. And then repeat it again. Once more. Don’t overload the lesson and cram in loads of new language items. It is better for the class to learn a single language item thoroughly than several badly. So in other words, have simple, basic goals for each lesson and stick to them. 3. One Step at a Time. Break the lesson down into small, easily digested chunks. The same principle is used for giving instructions. One. Step. At. A. Time. Students learn from their mistakes. Think about children learning their mother tongue and how they make mistakes. So when a student says something wrong they should never be criticized or made to feel bad; simply correct and move on. 5. Teach Grammar on a Need To Know basis. When a student asks for grammatical clarification, don’t overload with every context, shade or pattern. Give the basic information and move on. 6. Don’t Teach, Lead instead. It’s not necessary to present the language on a plate for your students to pick up and try to remember. It’s much better if the students work out for themselves what a word means or how a phrase is used, etc. In other words, don’t teach but let your class work out for themselves. They will learn better like this. You know how to speak English, your class doesn’t. Whenever you speak it means one of your students isn’t speaking and they’re the ones who need the practice, not you! Whenever possible have your students speak and not you! Teaching Grammar‏‎ – is it necessary?